Even with the improvement of the economy, many of us are still trying live conservatively. Why would you spend more money than you need to? That is why we put together this guide to help you get the most value out of your nutritional supplements. Keep reading to learn how to get the most for your money when it comes to taking supplements. To compensate for a lack of dietary nutrition: people do not always eat the best diet including a variety of foods. To boost health and help prevent disease: stress is common in our present-day society, and stress alone can deplete us of vital nutrients. It’s cheaper and easier to buy a good multivitamin than to buy all of the individual supplements that make up most multivitamins. Whatever your reasons are, a multivitamin is usually a great place to start. Make sure that your multivitamin contains at least 100% of the USRDA in the nutrients you are looking for. Taking a multivitamin at least a few times a week might be a safer bet than health insurance in this somewhat unstable economy. It’s also good to know that we offer a few different liquid multivitamin supplements to suit your individual needs. Take your multivitamin with a meal or shortly after for maximum absorption and assimilation. You don’t necessarily need to take a multivitamin every day to be healthy. In fact some people opt to take their multivitamins every other day or every three days. 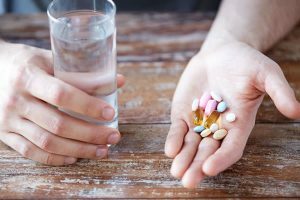 If you are unsure about how often to take your multivitamin, you can follow the directions on the label or consult with your health care professional. A multivitamin is a good supplement to have around, especially if you are on the go or experiencing greater levels of stress. Some of our customers take their multivitamins with Legendary Minerals to enhance their effectiveness. T. J. Clark products are catalyzed with PolyFloramin to enhance their effectiveness and we think you will find they are even more effective when taken with our Legendary Minerals. Quality first – In most cases we look for quality over quantity. Liquid makes sense – We prefer to take liquid vitamin supplements if possible for better assimilation. Maximum absorption – Make sure you are taking your supplement as directed on the label for maximum absorption and assimilation. You may want to consider taking our supplements with PolyFloramin. Many companies offer affiliate programs: where you can save money on your own purchases and even make a little extra. (or a lot extra in some cases!) It might be a good idea to ask your favorite supplement suppliers if they have any affiliate opportunities. There has never been a better time than right now to jump on board with one of our customized affiliate programs. We offer an affiliate program that is free to join and has no long term obligations of any kind. Join our affiliate program and start saving money on T.J. Clark supplements. If nothing else, we hope this article empowers you to save some money on your supplements. Every little bit helps. Remember that it is best to focus on quality first. Sometimes less is more. We are proud to offer you a complete line of quality nutritional supplements. The absorption of potassium chloride. liquid vs. tablet. Sunnybrook Hospital, University of Toronto Clinic. This is very useful information! I love your blog. Thanks for sharing your tips on weight loss supplements for women. This is my first time visiting your blog. Have a fantastic day.